Outdoor tax service marketing has the lowest cost-per-view of ANY form of advertising! Marketing studies indicate that roughly 63-70% potential clients always read outdoor advertising, with outdoor advertising being responsible for up to 87% of first-time visits. 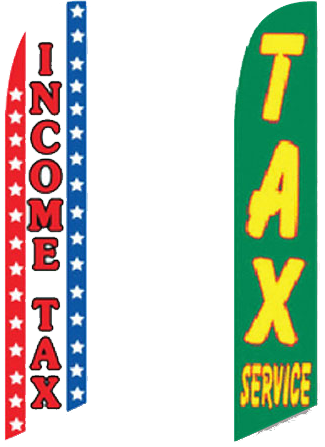 That being said, and outdoor tax flags and other tax marketing materials through Federal Direct is an excellent and affordable investment in your growing tax business. Fully assembled, these feather flags can stand over 16″tall; Guaranteed to catch someone’s eye! Flags are subject to availability, with multiple mounting options available. An entire kit (Flag, Mount and Shipping) can typically be purchased and shipped to your door for under $100. 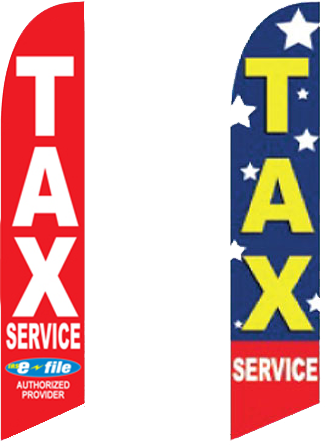 Contact Federal Direct and order your Tax Flag today!